What does it tell us? Well, while the North-East Coast’s burst of colors is past its peak by the first week in October, Lake Tahoe is just hitting its prime. According to the fall foliage map, the week of Oct. 15, 2017, is prime time for Sierra’s display. 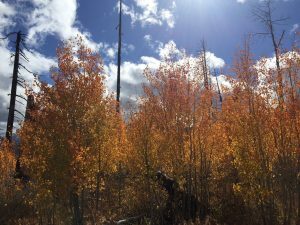 Fall Foliage hits its peak in Lake Tahoe in October. Easily accessible from U.S. Highway 50 with a paved bike and hiking trails, this meadow pops with color in the fall and leads down to the shoreline at Nevada Beach. Fallen Leaf Lake got its name for a reason. The beautiful lake has large swaths of Aspens along its shoreline. With parking options at the campground or snow park lot off Highway 89, the lake has trails that meander along the shoreline and through stands of Aspen groves and past historical ruins like Anita Baldwin’s private house on the lake’s west shore. Anita was the daughter of E.J. “Lucky” Baldwin the colorful mining and turf figure of the old west with ties to California including the Santa Anita Racetrack. Start at Big Meadow Trailhead on Highway 89 headed south toward Luther Pass. Fall brings fewer crowds and more parking spots at the trailhead. After crossing back over the highway there is a half-mile uphill hike to Big Meadow which sits at about 7,500 feet in elevation. After enjoying the meadow view head back into the forest and follow the signs to Round Lake. Further along Highway 89 at the junction with Highway 88 there plenty of road pullouts for a long or short hike among a network of trails that work their way through brilliant stands of Aspens. The West Carson River flows through the valley and offers excellent fishing opportunities. With trails that start at lake level at the California/Nevada state line and go all the way to the Tahoe Rim Trail, Van Sickle bi-state park is a great way to get a panoramic view of fall color on the South Shore. 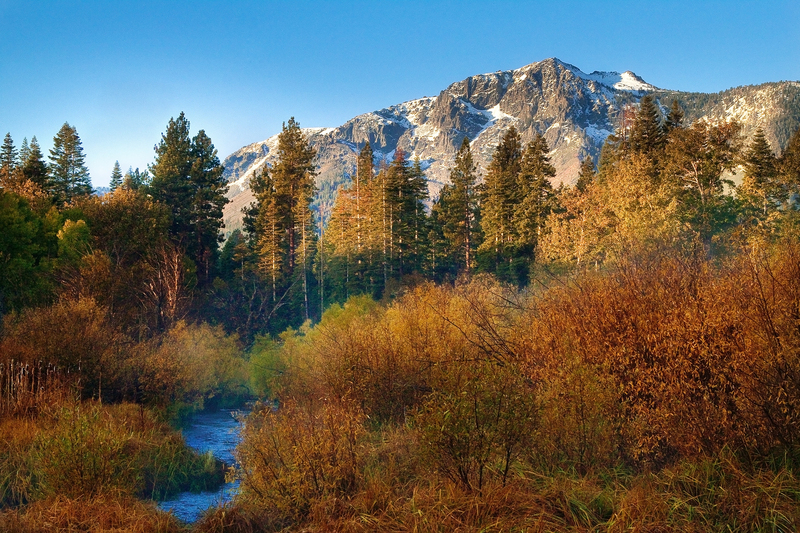 Take advantage of Lake Tahoe Resort Hotel’s fall special and catch Lake Tahoe’s peak season of color.